Who knew you could actually join in a large scale roadkill cook-off? Nothing brings people together like food. Whether it's a Thanksgiving dinner with your family or sharing wine and cheese with a friend in the park, eating is generally a social affair (Credit: WikimediaCommons/Graham McLellan). For some cultures, sometimes a single ingredient or dish is reason enough to join in celebration. Take barbecue, seafood, and agricultural festivals as a few common American examples. Some festivals stray from the beaten path of tradition, however, and make for some unique and unusual fetes. 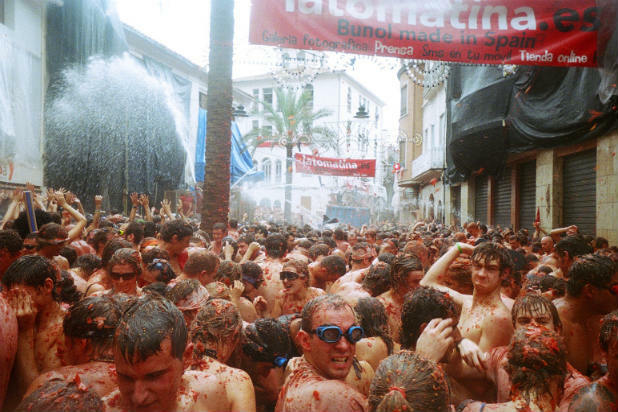 Whether people are smearing tomatoes into the hair and faces of loved ones at La Tomatina or hurling sausages into the air at the World Black Pudding Throwing Championships, food festivals all over the world express cultural pride in some relatively surprising ways. Really, who expected that you could actually join in a large scale roadkill cook-off?! We say the less run-of-the-mill a food festival is, the better. Check out our slideshow to see some of the best occasions and locations where you can let loose and celebrate food in unusual and surprising ways.